The United Nations General Assembly overwhelmingly defied U.S. warnings and voted Thursday to condemn President Donald Trump's decision to recognize Jerusalem as Israel's capital and move the U.S. Embassy there from Tel Aviv. The resolution passed with 128 member states voting in favor of the resolution, nine voting against, and 35 countries abstaining. Israel joined the U.S. in voting "no." Notable abstentions included U.S. allies Canada and Australia, as well as others like Mexico and Argentina. The vote came after U.S. Ambassador Nikki Haley issued a stern warning United Nations that the United States "will remember" countries that voted for the measure. 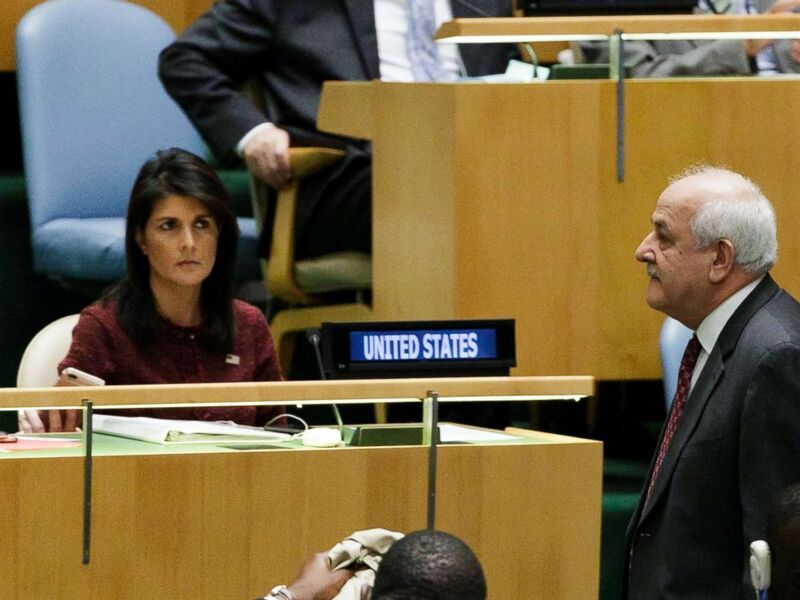 Haley hinted that U.S. financial support for the U.N. is not guaranteed and that the U.S. should not be expected to support an organization that condemned it. "The United States is by far the single largest contributor to the United Nations," she said, noting that "our participation in the U.N. produces great good for the world." "We do this because it represents who we are... when we make generous contributions to the U.N. we also have a legitimate expectation that our goodwill is recognized," she said. "If our investment fails, we have an obligation to spend our resources in more productive ways." Haley said "the United States will remember this day" when it was "singled out for attack." Riyad Mansour (R), Palestine's Permanent Observer to the United Nations, walks past U.S. Ambassador to the United Nations Nikki Haley (L), at the U.N. General Assembly, Dec. 21, 2017, at United Nations headquarters in New York. "America will put our embassy in Jerusalem," Haley said, adding that "no vote in the United Nations will make any difference on that. But this vote will make a difference on how Americans look on the U.N."
Haley warned on Tuesday that the U.S. would be "taking names" of member states that voted to condemn moves to recognize Jerusalem as Israel's capital.